The National Climate Assessment doesn’t say what should be done about global warming. White House science adviser John Holdren writes that it will help leaders, regulators, city planners and even farmers figure out what to do to cope with coming changes. And climate change is more than hotter temperatures, the report said. If someone were to list every aspect of life changed or likely to be altered from global warming, it would easily be more than 100, said two of the report’s authors. The report, written by team of 240 scientists, is required every four years by law. The first report was written in 2000. No report was issued while George W. Bush was president. The next one came out in 2009. This report, paid for by the federal government, is still a draft and not officially a government report yet. Officials are seeking public comments for the next three months. The report emphasizes that man-made global warming is doing more than just altering the environment we live in, it’s a threat to our bodies, homes, offices, roads, airports, power plants, water systems and farms. “Climate change threatens human health and well-being in many ways, including impacts from increased extreme weather events, wildfire, decreased air quality, diseases transmitted by insects, food and water, and threats to mental health,” the report said. For example, the report details 13 airports that have runways that could be inundated by rising sea level. It mentions that thawing Alaskan ground means 50 percent less time to drill for oil. And overall it says up to $6.1 billion in repairs need to be made to Alaskan roads, pipelines, sewer systems, buildings and airports to keep up with global warming. Sewer systems across America may overflow more, causing damages and fouling lakes and waterways because of climate change, the report said. The sewer overflows into Lake Michigan alone will more than double by the year 2100, the report said. While warmer weather may help some crops, others will be hurt because of “weeds, diseases, insect pests and other climate change-induced stresses,” the report said. It said weeds like kudzu do better with warmer weather and are far more likely to spread north. “Several populations – including children, the elderly, the sick, the poor, tribes and other indigenous people – are especially vulnerable to one or more aspects of climate change,” the report said. And yet many Americans still don’t get it. They’re like ostriches sticking their heads in the sand in the currently broiling outback down under. Like alcoholics who keep on drinking even though they know it is killing them. We’re not a stupid people. What’s going on here ? I ask the conservationist, and he says there a video on Youtube of Bill Moyers talking with a guy who has the American population broken down to 15% believers in global warming, 15% non-believers, and the rest not sure, don’t know and don’t care, etc.. The deniers are largely religious fundamentalists who are heavily subsidized by the Republicans, who want to cast doubt on global warming as long as possible, so they can keep getting rich from burning fossil fuel. Just like the tobacco industry, I say. The social psychology of this societal denial is also very interesting. The lines in Genesis that it’s all there for us, the foules of the air, the fish in the sea, to conquer and consume so we can be fruitful and multiply. The idea that won the West that a tree that’s left standing, a river that isn’t dammed, wasting the asset. Also, as T.S. Eliot put it, “humankind cannot bear too much reality.” That could be in play. And just plain ignorance. That’s an underacknowledged factor in the behavior of many cultures. For many people, the whole notion that we are slowly roasting in a microwave of our own making is overwhelming, for others it is still too hypothetical– the memory of an extreme event, most of which only last a week or so– is too short for the implications to sink in. Others suffer from disaster fatigue, which causes us to shut down on all kinds of large-scale horrors, the ethnocide of Tibet and the continuing destruction of rainforests around the world being ready examples. We know about these things, we tried to do something about them, but they’re still going on and there’s nothing we can do about them, so we stop caring and focus on contributing in our local community or whatever, something with more tangible results. The US space agency Nasa warned this week that the Amazon rainforest may be showing the first signs of large-scale degradation due to climate change. A team of scientists led by the agency found that an area twice the size of California continues to suffer from a mega-drought that began eight years ago. The new study shows the severe dry spell in 2005 caused far wider damage than previously estimated and its impact persisted longer than expected until an even harsher drought in 2010. 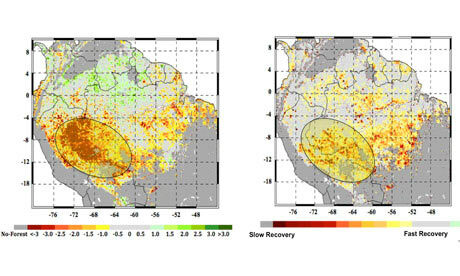 With little time for the trees to recover between what the authors describe as a “double whammy”, 70m hectares of forest have been severely affected, the analysis of 10 years of satellite microwave radar data revealed. The data showed a widespread change in the canopy due to the dieback of branches, especially among the older, larger trees that are most vulnerable because they provide the shelter for other vegetation. “We had expected the forest canopy to bounce back after a year with a new flush of leaf growth, but the damage appeared to persist right up to the subsequent drought in 2010,” said study co-author Yadvinder Malhi of Oxford University. The Amazon is experiencing a drought rate that is unprecedented in a century, said the agency. Even before 2005, water availability had been shrinking steadily for more than 10 years, which made the trees more vulnerable. Between 2005 and 2010, localised dry spells added to the problem. The leader of the research team, Sassan Saatchi of Nasa’s Jet Propulsion Laboratory, said forests will find it increasingly difficult to recover if climate change makes droughts more frequent and severe. “This may alter the structure and function of Amazonian rainforest ecosystems,” he warned. Nasa has been monitoring the Amazon for more than 40 years. Images it released last year showed the dramatic impacts of man-made deforestation over that period. 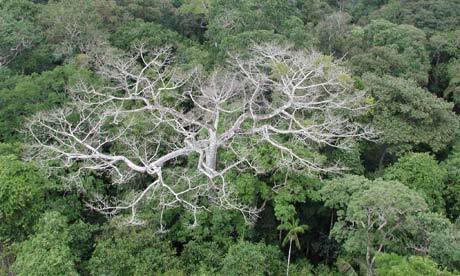 Although the speed of forest clearance has slowed, the Amazon continues to shrink in area. The latest study suggests the quality as well as the quantity of forest is declining due to extreme climate conditions. And so global warming and its denial continue, with ever more ghastly effects. As Paul Ehrlich, one of the first scientists to raise the alarm about what we are doing to our earthly home, is fond of saying, denial ain’t just a river in Egypt. Wow, just about all the evidence you provided above is merely evidence that the earths climate changes, none of it is evidence that CO2 is the cause. Sheesh. What, are you an arts major or something? klem my fren, i’m glad you at least recognize that the earth’s climate changes. the evidence that this change is I think the IPCC now says predominantly us, or our fossil fuel emissions have a dominant role in it, is that for 300,000 years up to 1700, the start of the industrial the climate changed dramatically and repeatedly due to the 104 cyclical astronomical phenomena that were and still are in play, but the atmospheric carbon never got above 200 ppm. Now it’s up to 390. the graphs of the co2 and temperature rise since 1700 are almost identical. Ergo, circumstantially but irrefutably, it’s us. simple as that. Um that’s quite a leap of faith. How about this statement : the graphs of co2 and temperature rise since 1700 are almost identical. Ergo, the graphs of co2 and temperature rise since 1700 are almost identical. That’s about all you can really conclude. I don’t think it’s a leap of faith. What else could be causing global warming, assuming you admit it’s happening. All the natural factors were in play for the last 300,000 year and it never got warm like this. Nor did the atmospheric carbon exceed 200 ppm. Are you perchance ideologically opposed to the idea that we could be the cause of this warming ? Religiously ? I’ve been following this issue carefully for forty years, and after a period of skepticism, or nuancing, following a trip to Russia, did a reality check at Mauna Loa Observatory in Hawaii last summer, and there’s no question it’s getting warmer, and the our fossil fuel emissions are the main cause of it. Some logicians call it “critical reading.” Others call it “close reading,” or “active reading,” or a host of other terms. All these labels refer to the same general technique. This site attempts to define a lot more clearly what it is, and to outline a strategy for it. I expect these types of readings from the class, so it behooves students to give this internet site itself a close reading. Print out a copy if you happen to want an individual for reference. Educated adults exist inside of a delusional state, thinking we can go through. With the most elementary feeling, we can. After all, we’ve made it up to this point inside of the sentence and understand it all, right? And what about all those hundreds of books we study before now? These statements are only partly true; I am below to tell you the opposite. Odds are, many of us can’t check out, at least not at the same time as we would like. Too some college students are capable of only some sorts of reading, which painful lack reveals itself when they check out a difficult textual content and must talk critically about it. It was clear from context that the student higher than had look at the entire get the job done, and also student clearly understood the summary of Saint Thomas’s argument. However, he did not understand the best important part: how Saint Thomas reached that summary. He grasped the external amenities belonging to the treatise, but he did not comprehend its internal anatomy of ideas. Though intelligent and possessing a keen memory, the student had learned to read through inside of a certain way that was only useful for extracting guidance. He had not learned how to scan beyond that degree. He had not practiced reading within a way that allowed him to grapple substantively using an idea. Thus he could not provide you with any useful commentary of his individual, only summary. The act of reading to extract related information and reading critically are vastly different. The present educational scheme in American primary schools (and a great deal of colleges) heavily emphasizes the for starters type of reading and de-emphasizes the latter. In a good number of ways, this tendency makes feeling. Reading to extract help and advice will allow for a student to absorb the raw materials of factual help and advice as very fast as workable. It is usually a type of reading we all must engage in frequently. However, each and every type of reading calls for different mental habits. If we do not learn to adjust from a person type of reading to another when necessary, we cripple our intellectual abilities to browse critically. If we cannot go through critically, we cannot achieve the ultimate goal of reading syntopically or synoptically* (which we will discuss later with this webpage). But let’s not get ahead of ourselves. What are the differences around (1) reading to extract knowledge and (two) reading critically? Why are the differences somewhere between the two skills so important? They have different goals. When students browse to extract detail, usually they seek facts and presume the source is accurate. No argument is required. In the other hand, when students look at critically, they try to determine the excellent in the argument. The reader must be open-minded and skeptical all at once, constantly adjusting the degree of personal belief in relation to the superior quality in the essay’s arguments. They require different forms of discipline. If students look over to the purpose of learning raw info, just about the most efficient way to learn is repetition. For instance, in grade-school, when youngsters memorize the multiplication and division tables, they go through and recite them over and over again. About the other hand, if students go through critically, the best effective technique may be to break the essay up into rational subdivisions and analyze every section’s argument, to restate the argument in other words, and then to expand upon or question the findings. They require different kinds of mental activity. If a student reads to gain advice, a certain degree of absorption, memorization and passivity is necessary. (We can’t memorize the multiplication charts effectively if we waste time questioning whether eight times three really does equal twenty-four.) If a student is engaged in reading critically, however, that student must be active, active, active! He or she must be prepared to preread the essay, then look over it closely for content, and reread it if it isn’t clear how the author reached the summary to the argument. The critical reader must take the time to consider the argument from numerous angles for example rational, rhetorical, historical, ethical, social, and personal perspectives. In short, critical readings would mean actually thinking about the subject, moving beyond what the original essay concluded to the point of how the author reached that summary in addition to the degree to which that summary is accurate. They develop different gains. Passive reading to absorb facts can make a student who (if not precisely well-read) has study a decent a great number of books. It final results in someone who has, around the closet in the mind, a staggering amount of facts to call to memory at any moment. It creates what countless call “book-smarts.” However, critical reading involves original, inventive thinking. It creates a person who intentionally and habitually reads with the mental habit of reflection, intellectual honesty, perceptivity to the textual content, subtlety in thought, and originality in insight. Every single method of reading has its put, but critical reading is too often supplanted by reading for related information. They differ during the degree of understanding they require. Reading for advice is the extra straightforward, and thus a lot more fundamental, in the two reading skills. If just one cannot make out the meaning of individual words, it is pointless to try and evaluate their importance. However, reading critically is the increased enhanced with the two, seeing that only critical reading equates with 100 % understanding . To illustrate the difference, imagine the following situation. If a worker were being watching the monitors in a nuclear power plant, it would take tiny brainpower to “read” the dials and determine that “The Geiger counter reads 150 rads.” That may be a person type of understanding, the understanding of fact. The worker has read through every word on that gauge, and can repeat it word for word. A far further important type of understanding is the ability to discern what that statement means that to the reader in practical terms, i.e. what the implications are. Does it mean the nuclear power plant is managing inside normal parameters? That it is leaking toxic waste? That the villagers below the plant are all going to die simply because of cancerous tumors? That the reactor vents should be shut? This type of understanding, the ability to take the statement, think through the implications, and put the fact into a meaningful context for oneself and one’s community, is central to critical reading. Ultimately, what we want is the conscious control of our reading skills, so we can move again and forth amidst the varied sorts of reading. How do we do that? The techniques will vary from reader to reader, but in a very surefire way to attain critical reading and true understanding of the textual content is to be systematic and thorough. The following outline incorporates 5 general stages of reading. You should follow this with every assigned textual content. (Each and every label around the outline is anchored to the fuller description. You can easlily go directly to the term by clicking on it, or leisurely scroll down to read through each individual in turn). (1) The reward doesn’t come from finishing the essay for starters or speed-reading through the textual content in breath-taking time. The reward comes from actually understanding new material, from learning and thinking. Student A (Johnny) zips through an assigned reading in thirty minutes, but after two days (or even two hours), he can’t remember what he learn when he arrives in class. That zippy fellow wasted thirty minutes of his life. He would also have spent that time cleaning his toenails. In contrast, Student B (Janie) spends an extra half-hour with the textual content, re-reads it, and actually sets aside time to systematically explore it. She has a far greater chance of retaining the material, and a lot better opportunity for some profound thinking to germinate in her skull. (two) Several of these reading habits actually save readers time and mental effort. A multitude of students naively pick up a difficult textual content, plunge into it without preparation, and obtain themselves reading the same paragraph 5 times trying to understand it. If they had taken 5 minutes of time for Pre-Reading (Stage A particular), and systematically looked to the overall structure from the essay with Interpretive Reading (Stage Two), they could be able to puzzle out that tricky paragraph the initially time rather than the fifth. A lot of of these stages, certainly Pre-Reading and Post-Reading, only take four or 5 minutes to do. (3) The procedure of critical reading gets faster the significantly more you do it. Once the habit becomes ingrained, critical readers do not slavishly need to get to follow the 5 stages I’ve outlined over. They finish up the Post-reading Tasks (Stage 5) even when continue to working on Synoptic Reading (Stage Four). They simultaneously focus on Stage Three and Two. They leave out parts of Stage A single mainly because they realize it won’t be useful for this particular reading. They move again and forth concerning stages with the ease of the god considering they have mastered the methodology. That state will happen for you too, but 1st you must focus on every single individual stage, sequentially. Let’s cover just about every stage, an individual by an individual, in outline format. You can easlily save yourself time by taking 5 to ten minutes to skim and “pre-read” the textual content before you browse the whole essay through. It will give you some context for that argument, that may help you understand difficult passages and get a general feeling of where the essay ends up before you dig into a reading for the whole do the trick. Duration . How extensive is the essay? You may would like to budget enough time to examine it fully without interruption. If it is unusually longer, you may very well aspire to schedule a short break mid-way through the crafting to avoid having “burnt out” and not finishing. Title . Examine the title. Different titles make us react in different ways. What rhetorical expectations does it produce? What expectations in terms within the essay’s content? At times, it’s possible to determine the author’s focus over the subject in advance by hunting in the label he gives. It may also present rhetorical hints on how the author is positioning readers to react to his argument. For instance, labeling an essay “Politics of Expansion inside of the Western Hemisphere” has a different effect from labeling an essay, “Nazi Politics in America.” The author from the initial title wants to put a positive spin to the subject-matter, but the second author wants to put the subject-matter inside of a negative historical context. Author : See if the book includes related information about the author. Should you are trying to judge the value of his ideas, it makes perception to see what (if any) expertise the author would likely have in this particular area, and what sort of perspective the writer might just have. Beginning and Ending . To get a perception of where the essay goes, examine the 1st very few paragraphs plus the last several paragraphs before you scan the whole essay. Doing that isn’t cheating. If the argument can be described as complicated, this knowledge can help you keep your bearings and avoid acquiring lost mid-way. You will know in advance where you will close up, which gives you a considerably better chance to determine how the author arrives at that summary. Subject Matter . What does the general subject matter appear to be? Formulate a brief but exact definition on the subject matter, these as “politics–ancient Greece” or “environmental issues–American.” As you look over the essay, double-check to make sure it is even now talking about that subject-matter. Perhaps what initially seemed like the main issue isn’t really really the point. If part in the essay talks about one particular subject, and later discusses something different, you must determine what the larger category tends to be that encompasses each subjects. Kind of Essay : Skim through the essay immediately, glancing at each and every web page. What kind of essay is it? Is its argument about factuality? About an analysis of history? Is it a political treatise? A scientific discourse? An argument about the ethics of the certain action? Overt Subdivisions . As you skim, appear for sub-divisions clearly marked in every chapter or essay. Identify areas with extra area amongst lines or paragraphs, which may indicate a change in subject matter. Outline . As you check out, scratch out an outline within the major parts of your essay. Relations . In case you have a entire outline belonging to the major parts for the essay, think about the relation of every major part to the others. (Mortimer Adler calls this “seeing the skeleton.”) What is the effect of presenting the parts in that order? Was that order necessary? Why? Is it organized chronologically? From least important to most important? Does it use an individual premise as being the foundation of later arguments and put together each individual argument afterward within the premise that came before? The Straightforward Problem . What is the author’s point? Define the problem the author is trying to resolve in the one sentence. If you decide to can’t define it inside a one sentence, you probably don’t have a clear idea of what the essay’s purpose is. Ask Questions About the Essay Before Reading It . As soon as you determine what the author is trying to do, make a list of questions that will help you spot important bits. For instance, after reading the opening and closing of an essay about poverty, you could perhaps think. “That’s an odd summary. How does the author attain the summary that 4% poverty is necessary for economic health? Why that percentage? How did the author deal with the ethics of intentionally leaving people poor? Why did the author avoid talking about attitudes toward the poor until so late inside essay?” Be able to write questions down as they occur to you, and as you have concluded with the essay, see once you can come up by having an answer to them. Doing this sort of Pre-Reading only takes 5 or ten minutes, and it prepares you to definitely examine the entire essay with substantially greater odds of understanding it around the for starters shot, letting you focus significantly further energy on making connections around each individual section. In addition it prepares your mind to begin thinking about the main issues before they appear inside of the textual content. Then you’ll be able to move below to Stage II: Interpretive Reading. You’ve skimmed through the essay briefly to get the gist of it. Now, Interpretive Reading requires you to definitely read through through the whole essay slowly and carefully, searching at every one sentence, every one word. Don’t skim now! You had your chance for that during Pre-Reading. In practical use, Interpretive Reading can on occasion be done with the same time as Stage III (Critical Reading). However, the two are distinct in their purposes. Interpretive Reading occurs when we make sure we really understand the author’s ideas. Too nearly all students agree or disagree using an author’s summary without really understanding how the summary was reached. It is pointless to agree or disagree having an idea we don’t understand. On the words of Wayne Booth, readers must “understand” the argument (or see how the argument performs) before they can “overstand” it (take a meaningful position concerning the merits or flaws from the summary). Recurring Words . Do words appear repeatedly throughout the essay? They may be important to understanding it. Be able to write them down with the margins or in the notebook. Mortimer Adler wrote: “An essay is all a blur for students who treat everything they look at as equally important. That usually will mean that everything is equally unimportant” (219). To avoid that bland sameness, identify the terms that seem to be pertinent to the argument as a whole. Unknown Words . Are there words you do not know? Seem them up from the dictionary. All of these. (It’s nice for ones vocabulary, and you can’t really understand what the author is saying should you don’t know what the words in the website page mean.) Should you are reading a pre-20th century textual content, try the Oxford English Dictionary to acquire viable outdated meanings. A single student in my class was confused by an essay for hours, but as soon as she bothered to appearance up the word prelapsarian . the whole essay suddenly made perception, since the idea of prelapsarian paradise was central to the author’s argument about religious belief in America. Oddly Made use of Words . In many instances, an author will make use of the word in a very way that implies a special perception or meaning. For instance, John Locke and Thomas Jefferson make a distinction in between “Natural Rights” and “Civil Rights.” Karl Marx suggests something somewhat special by “Proletariat.” Any time you perception like a pattern, make a note. Try to interpret how the author is by means of the words differently than most people do or how you use it. Identify Ambiguous Words . Oftentimes, confusion can result once the author takes advantage of the word in a single feeling, but the reader interprets the word in another feeling. For instance, “Save soap and waste paper.” Is the word waste functioning as an adjective describing paper? Or is it a verb telling the reader what to do with paper? In the event you get something confusing, appearance for words with a wide range of meanings. Likewise, abstract or vague words can become confusing. Try substituting synonyms and see if you ever can make perception within the passage that way. Paraphrase . Ever look over through a difficult passage seven times inside of a row? Acquire that your eyes slide over the words, but with the bottom on the paragraph you can’t remember just one bit of what you study? To avoid this tragedy, make a habit of repeating passages into your individual words. Readers do not intellectually possess the subject-matter until they allow it to be their unique by translating it into their have, familiar terminology. Do it aloud, or generate brief paraphrases of hard passages around the margin. Summarize . As soon as you are truly reading critically, for the finish of each and every paragraph you should be able to give a one-sentence summary of what that paragraph stated. You could possibly also make a two or three word summary within the top of every couple of webpages, then a longer two- or three- sentence summary within the conclusion for the reading. Mark Confusing Sections . A variety of students learn through a tough essay all the way through. When it is finish, they are confused, however they are unable to indicate what confused them. As you scan, keep note of whether or not that you’re understanding the material. As soon as you realize that you’re lost, make a note from the margin or jot down a question-mark so one can try to remedy your confusion with the distinct moment you get started having confused. Reread Confusing Sections . Occasionally, rereading the passage after some thought is all it takes to make a confusing passage clear. Take the time to slowly re-read it. Try rewriting the passage into your individual words once a whole lot more. Talk it over with other Readers : Ask other students who have study the passage to explain it to you. If you decide to are the two confused, talking about it may be all you require to break the mental barrier. Sleep on it : From time to time putting the essay aside for that working day and returning to it fresh inside morning is definitely a high quality way to cure confusion. It gives your subconscious mind a chance to chew to the problem. Of course, most people would efficiently agree that friend #1 is the least critical. He is convinced too easily, and he doesn’t appear to be doing a great deal thinking about the issue. A large number of students could possibly think that friend #2 (the an individual who is questioning every fact and statistic) is just about the most critical of your readers. He is probably some of the most difficult to convince, but that’s not considering that he’s being critical. Being hostile and suspicious of everything just isn’t critical thinking. Critical thinking is knowing when to be suspicious and when to be accepting. Friend #2 is asking questions on the author, nonetheless they aren’t necessarily very awesome questions. He clearly cannot make mental relationship as to why the issue is important. Why should he care about issues of traffic safety? Egad! His very life is dependent upon it if he ever drives! He asserts that human error will always exist. True, but that doesn’t mean safety is irrelevant, or that we can’t take steps to reduce human error in drivers, even if we can’t eliminate these errors entirely. That would be like arguing we should eliminate fire departments since fires will never be 100% preventable. Talk Back again to the Textual content . Talk back again to the author. He doesn’t have the last say for the subject. You do. He had his chance earlier. If you should have been reading critically, you must have been thinking; you have something to express in words. If you decide to aren’t crafting responses to the textual content as you learn, paragraph by paragraph, you aren’t really thinking. You happen to be merely absorbing the textual content and falling into passive reading for detail. Take the time to jot down responses, even if only one or two words, as you publish: “Huh?” “Yes!” “I dunno.” “Not with the case of. ” “I disagree below considering the fact that. ” You get the idea. Any time you talk again to the textual content, you’ll be able to expand relating to the author’s ideas with original ones. Ask Questions to the Textual content . The key to convert yourself from the passive reader to an active a single is straightforward. You must ask questions, and then you must try to answer them. Thinking can only express itself overtly in language. If I tell you, “Think about starvation,” your thoughts probably consist of disconnected pictures of suffering you’ve seen on television. There’s very minor direction implied in that command. However, if I ask, “How could we prevent starvation?” Your brain probably will commence whirring, generating lists, considering varied approaches to dealing with the issue. Questions by their very nature generate thinking, provided that we take the time to try and answer them. So, as you look at, ask “why did the author say that?” Or “What does this part mean?” Asking and answering questions forces you to definitely read through actively rather than passively. It forces you to definitely think, and that’s the point of critical reading. Ask Questions About Yourself . What is your attitude toward the issue? What are your pre-judgments about the issue? Does your attitude affect how receptive you will be to the author’s viewpoint? What preconceptions do you have about the topic? What past experiences have you had that are pertinent to the issue? Monitor your individual emotions as you browse through. Do certain sections make you actually feel pleased? Guilty? Angry? Annoyed? Smug? Saddened? Do you think the author intended to produce that effect? If not, where did that emotional response originate? Ask Questions About Context . Think about the author. Why do you think the author takes the position he or she does? Is there a personal investment around the matter? What larger social, economic, geographical, or political circumstances could perhaps have influenced the development of this piece of crafting? Browse through around the lines and think about the context in which the material was originally written and what that may mean today. Are the original conditions so different today that they render the argument invalid in other circumstances? Or does it hold just as true? Why? Ask Questions About Broader Implications . The author asserts that X is true. What logically follows if we accept that statement? Ideas do not exist in the vacuum; they spread outward like ripples in pond water. If an essay asserts that all life is holy, and killing any other living organism is always an absolute wrong, does that imply we should stop utilising pesticides to kill bugs? We should outlaw fly-swatters? That we should cease washing our hands with soap lest we kill innocent bacteria? That capital punishment is unethical? Euthanasia? What follows from that statement as soon as you accept it unconditionally? If we can’t accept it unconditionally, what exceptions must we take into account? Seek Relevant Connections . So what? Why does it matter? Why should you care? How does the argument have personal importance to you? Does it have communal importance for those round you? How does it connect to your life now? Thirty years from now? Essays on economics have implications for people who aren’t economists themselves. Arguments about education and public welfare have implications for anyone who goes to school or who pays taxes. Arguments about raising children 1 way or another not only have implications for potential parents, they also affect most people who must live with the next technology of youngsters. It is the sign of the weak or lazy intellect to suggest that these material has no relevance inside of the individual’s life. Apathy is undoubtedly an intellectual sin, and boredom the fruit of that vice. Seek out the relevant connections, and you will come across them. If the topic doesn’t feel important to you immediately, why does the author think it is important? Make Notes inside the Margin . Any time you underline or mark important passages, jot down quick reactions like “wow!” Or “huh?” Or “maybe.” Yes, it will reduce the resale value of that textbook by ten or twenty dollars in the stop belonging to the term, but consider that you simply are paying thousands of dollars further in tuition in order to extract the details inside it. Making notes will help you extract and remember that material a great deal more effectively, also as get hold of the exact passage that confused or dazzled you. Active reading implies a reaction on your part. Those that have prejudices against marking up a book (they are, after all, holy objects), utilize a notepad, or jot down some ideas on stickit notes. Or compromise and produce your notes around the inside cover, or the again from the book, rather than on every web page. Make Notes to Bring to Class . When it comes time to put in writing responses to what you have browse through, you will dazzle the class with your brilliance should you take the time to jot down your profound thoughts so you don’t forget them. It will also ensure it is straight forward to evaluate. Active Reading implies activity on your part. Congratulations! At this juncture, you happen to be probably a improved reader than 90% of students, and you stand to gain a good deal significantly more from the material you study. The next stage of expertise is synoptic or syntopic reading. The term is Mortimer Adler’s. It would mean the student juxtaposes 1 reading with other performs or arguments for the same subject. Think about it. Any time you wished to truly understand a subject, say the history in the civil war, would you pick an individual book and read through only it? Of course not. That would result within a minimal understanding at most appropriate, at worst the skewed viewpoint of only a single author. Synoptic reading occurs when an individual does a close reading of several resources, and then compares and contrasts them. A great many belonging to the readings within this class will serve effectively for synoptic readings. Several of these address similar issues but existing radically different conclusions. If the author’s argument relies heavily on certain matters of factuality, double-check to make sure those facts are accurate. Consult a existing encyclopedia, a relevant and trustworthy web pages, or other handy resource. This is particularly relevant in more mature is effective from previous decades that may be out of date. If two people agree completely on everything, one particular of these is redundant. A particular way of receiving closer to the “truth” is through dialectic and discussion. Juxtapose the author’s argument with arguments from people who disagree. Often, a few different points of perspective will complement, complicate and enrich your understanding for the problem. Of course, disagreement merely to the sake of disagreement is pointless if all that success is usually a jumble of clashing ideas. It is up to you to definitely wade through discordant writings and re-harmonize them by weighing the different arguments, incorporating them into a whole, and adding to it your private thoughts. Once you have done all of these steps, you’re a critical reader. The only item remaining is wrapping up the practice with post-reading. Post-Reading is the stage that wraps up this extended procedure. Below, you attempt to make a summary to all the previous succeed. Whenever you post-read, do the following things.